I've been following this ever since the anime version of season 1 ended. I prefer the anime over the manga but I can't wait for season 2. Anyone else following the comic? What do you think so far? It seems like the titans and putting humanity behind walls was an effort to gain some kind of peace for the world. Before that every faction of humanity was at war: nation, races, religions, etc. So someone created the idea that if there was some common threat humanity would band together for protection and live in harmony. 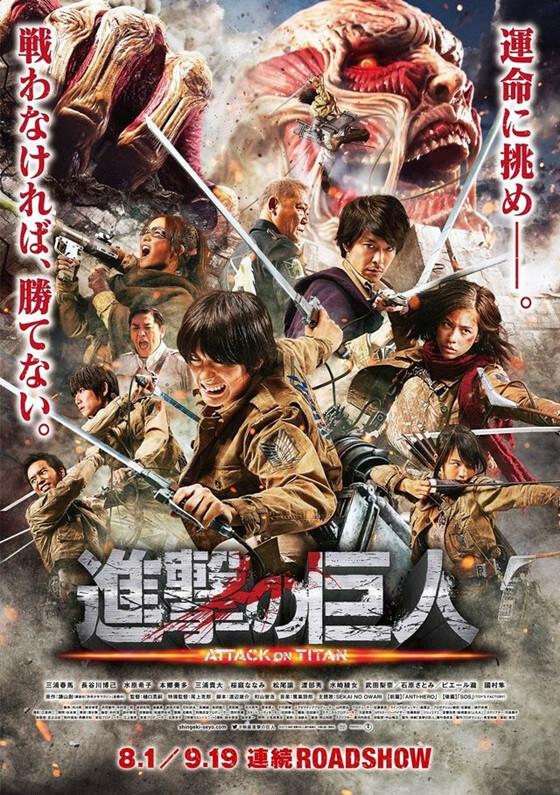 The titans hadn't attacked for years and years until the beginning of the AOT series. So something changed but we don't know why. Maybe it's because Grisha, like Erwin's father, realized that something wasn't right, and that they were living in a fishbowl. He discovered the truth or partial truth, and stole the secret of the titan's power. The colossal titan and the armored titan were sent to attack the humanity, but their target was the Yaeger family. Grisha, seeing that the titans were on to him or out to get him, passed on the power of the titans to Eren. So basically, a small few realize their kind of in low tech version of "the matrix" and they want to go out into the real world. The powers that be decided for everyone that it's better to live in a fishbowl and not live outside in a complicated war where the threat of world war is always present. This reminded me to read the latest chapter, but apparently I missed last month's chapter because I'm lost (and i don't have a Crunchyroll premium account at the moment so I can't look it up). the monkey titan. He hasn't been explained yet. I've read the latest chapter so don't read anymore unless it doesn't matter. I'm glad that their going back to the basement but at this rate it's going to take forever. Plus, I'm much more interested in the question that Erwin asked his father when he was a kid. What question was it that his father, a teacher, couldn't answer, that got him to spill the beans about the way the world was and why no one can remember anything. Then there's the revelation of the "first titan." And what the monkey titan is doing within the walls. Re-reading, the wall couldn't have been attacked in revenge of Grisha stealing the titan power from Geographia. Apparently the Reiss family was praying when the walls were breached by Colossal and Armored, and thats when Greisha attacked them. Normally I don't like speculating on these things because I want to be surprised but damn, the writer really draws things out. I was hoping that we'd find out the secret in the basement at the end of season 1 of the animated series. I think the answer to Monkey Titan will be learned sometimes later issue - perhaps at the basement. Did anyone see this month issue of Attack on Titan? They mentioned there's Attack on Titan movie? Look like bit different from manga/anime. I was wondering what kind of ending are they going to put in since the manga isn't completed - unless it did completed while English version manga lagged behind. It's going to be a two part movie. The first part premieres on August 1st, and the second part premieres on Sept 19th. I'm guessing they'll probably finish with The Struggle for Trost (anime episode 13). I think Part 1 will cover the first 5 episodes, up until Eren gets eaten by the Titan. And then Part 2 will cover Eren becoming a Titan and eventually blocking the gate with the boulder. The reason I don't think it'll go past episode 13, is because I don't see Annie or Levi in the cast. And they both play big parts after episode 13. But I'm just guessing. I could be wrong. All I know is people were mad because the trailer shows a scene where Mikasa is kissed by some Levi-replacement. Plus missile launchers. You probably mean Mikasa kissed Eren. In manga/anime, they never kiss at all. I didn't see any missile launchers in preview. The Stinger missile launcher Hange (or whoever the girl with glasses is in the movie) has at the very end of the scene. She's also holding either that or a bazooka in the poster. So did that instructor guy intentionally make it harder for Eren during his training, so that he looked like a failure? Or did he just push him harder because of his relationship with Eren's parents? Okay, thanks for the link since I haven't seen that article. I couldn't tell who's who in the trailer and I do know Mikasa have a feeling for him but they never go beyond friendship (or adopted sibling). It's possible. It seems to me the instructor is afraid something big going to happen. Eren's parents kept saying he is "special" - the question is what "special" he has? I would say "having feelings for Eren" is putting it lightly, she's obviously very attached to him and will kill anyone who even looks at him the wrong way (whether threatening him, or girls spending time with him), in addition to the whole thing with the scarf. It's possible the scene in question has her utterly destroying "the strongest of humanity" after the kiss or something, but I can understand why fans were upset. 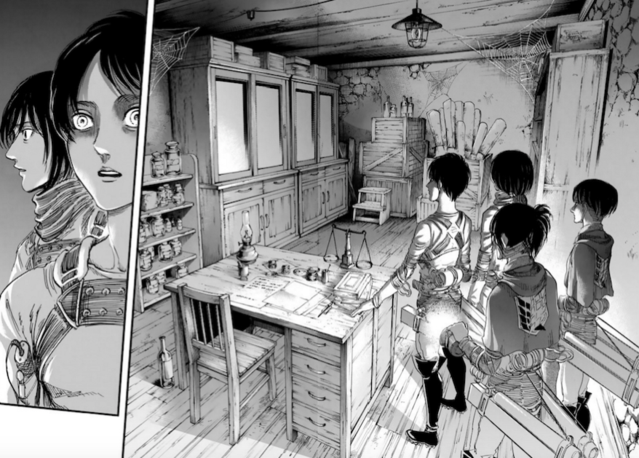 The chapter shows that the instructor/former survey groups leader, who loved Eren's mother and was jealous of his father, intended to protect Eren and didn't want him to die fighting the Titans (he was also mad at Eren's dad for putting the onus on Eren to avenge his mother). He's shown fiddling with the anti-titan gear in a flashback, after which they show the time Eren righted himself through sheer determination. Last edited by fujishig; 07-17-15 at 07:34 PM. Attack On Titan: Junior High anime series will be coming in the Fall 2015 season. Coming this Winter to the PS3, PS4 and PS Vita. Did I mention how much I hate waiting for monthly manga (weekly Shonen Jump has really spoiled me)? This story just seems to be dragging on, though next chapter it looks like something big will start happening, at least. I didn't like the Uprising arc. That just dragged on and on for 20 chapters. I think the last time the manga was really exciting was Chapter 50 ("Scream"). Looks like they're finally getting back to some action. The next couple chapters should be really good. Yeah, the action is definitely heating up with this last chapter. The latest chapter (#82) was just released on Crunchyroll. It's pretty epic. I was reading that during my break time, I actually shout "NOOOOOO" when the steel Titan blew Sasha away. Everyone looked at me like "wtf?" lol Sasha did came back to finish her job, but I hope she's okay. It's unfortunately that Armin sacrificed his life to beat the giant Titan. Wasn't that Hange, not Sasha? Also there has to be a rabbit they pull out of a hat with that ending, right?